Next we move to General Plot Options on the Plot Publish Tab. The first option is to either leave the Paper Space size as set int he drawing or to set it to the plotter sizes. I keep it as the Drawing defines it. I may use the plot device if I get files from others. 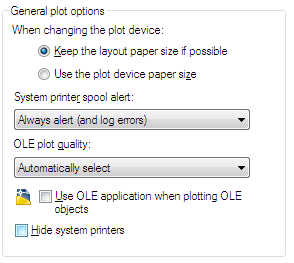 You will get a warning if the system cannot plot at the Paper size selected for that plotter, but you can turn that off by setting PAPERUPDATE to 0 (zero). System printer spool alerts let you turn on notifications. You can set it yo tell you everything and also log it to telling you nothing and logging nothing. You can keep it turned on,but I would turn off the logging unless you are having trouble or need to track plots. Most people get annoyed with alerts and turn it off altogether. OLE plot quality – determines the quality of plotted OLE objects. The options are Monochrome, Low Graphics, High Graphics, and Automatically Select. Not much use for this if you are not using OLE embeds. Launches the application used to create the OLE object when plotting a drawing with OLE objects. You can use this option to optimize the quality of plotted OLE objects. This setting is saved in the drawing. IF you are getting bad plots then you may want to turn this on. By default AutoCAD shows you every last plotter that it can find. If you are on a network, then the list can get long. You can shorten it a little by clicking this box. It controls whether Windows system printers are displayed in the Plot and Page Setup dialog boxes. It does not hide Windows system printers that have been configured using the Add-a-Plotter wizard. You can also control the size of the list of devices in the Plot and Page Setup dialog boxes by moving a device’s PC3 file out of the Plotters folder and its sub-folders. I am not sure if it still does it, but prior releases check every plotter in the list to see if they are still good to go. If it takes you a long time to open the plot dialog – look to see how many devices it find. Get the list as short as possible.